The Modbus Server Simulator is designed to assist developers using the Modbus protocol. All Modbus data are displayed in the Server Simulator and allows debugging of Client applications. 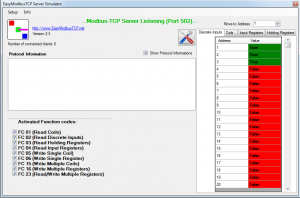 The Server Simulator supports Modbus TCP, Modbus UDP and Modbus RTU in the .NET Version. The JAVA-Version supports Modbus TCP. The current Values of Discrete Inputs; coils; Holding Registers and Input Registers are displayed, and can be changed.